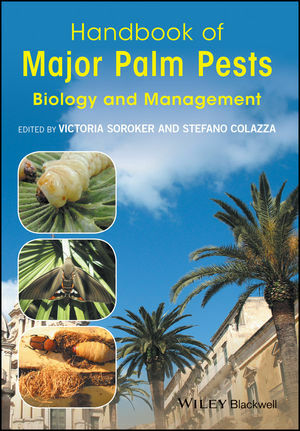 Handbook of Major Palm Pests: Biology and Management contains the most comprehensive and up-to-date information on the red palm weevil and the palm borer moth, two newly emergent invasive palm pests which are adversely affecting palm trees around the world. It provides state-of-the-art scientific information on the ecology, biology, and management of palm pests from a global group of experts in the field. An essential compendium for anyone working with or studying palms, it is dedicated to the detection, eradication, and containment of these invasive species, which threaten the health and very existence of global palm crops. Victoria Soroker is Senior Researcher in the Department of Entomology at Agricultural Research Organization, The Volcani Center, Israel and a lecturer at Hebrew University of Jerusalem. Her work over 30 years involves both basic aspects of insect physiology, chemical ecology and behavior of several insects and mites as well as applied research towards development of integrated pest management practices. For the last 16 years much of her research efforts have focused around finding solution for detection and control of the date palm pest and especially red palm weevil. Over the years she has mentored graduate students and published widely in peer-reviewed journals. Currently she serves as a president of the Entomological Society of Israel. Stefano Colazza is Professor at the Department of Agricultural and Forest Sciences at the University of Palermo, Italy. He is a specialist in infochemicals and behavioral ecology of plant, insect, herbivores and insect parasitoid interactions, with a special interest in the chemical ecology of plant volatile organic compounds in a tri-trophic context. He has been involved in these research areas for over 30 years and his work has been published widely in peer-reviewed journals. He is the co-editor of Chemical Ecology of Insect Parasitoids (Wiley-Blackwell, 2013).